Namibia has a population of about 1 750 black rhino, making up more than a third of the world’s global population! But the black rhinos of Namibia are unique, thriving even in a harsh, desert-like landscape. They have evolved to survive without water for several days and have even developed a resistance to the toxic chemicals in the plants that they depend on for survival during long droughts. They also have much bigger ranges than other species of black rhino. 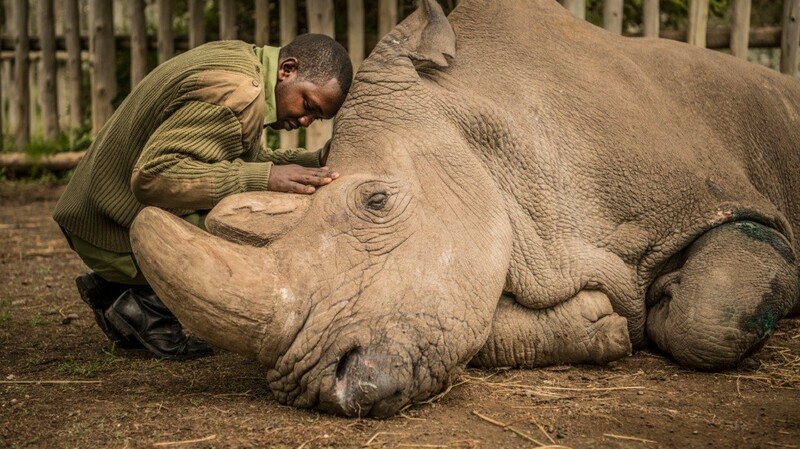 The plight of the rhino has long received world-recognition, but even more so now since the death of Sudan – the world’s last male northern white rhino – just last month. 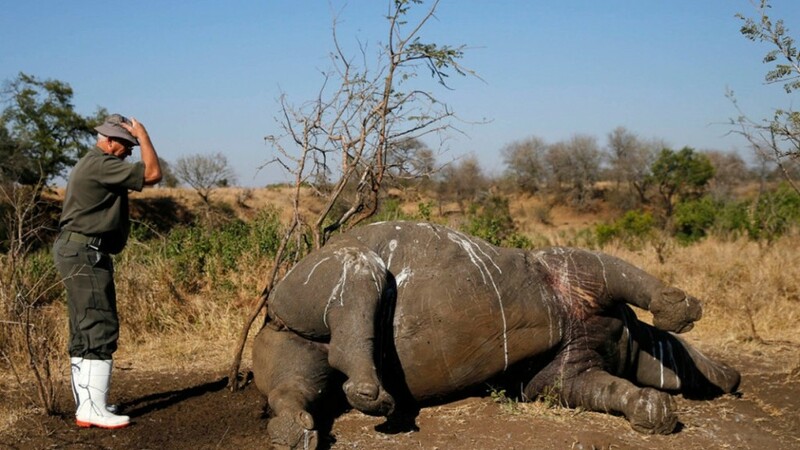 The current poaching crisis has deep-seated roots in Zimbabwe, where the difficult socio-economic and political climate facilitated rhino poaching. Once the easy pickings had been had in Zimbabwe, poaching gangs turned their attention to neighbouring South Africa, which suffered massive increases in poaching between 2009-2014. 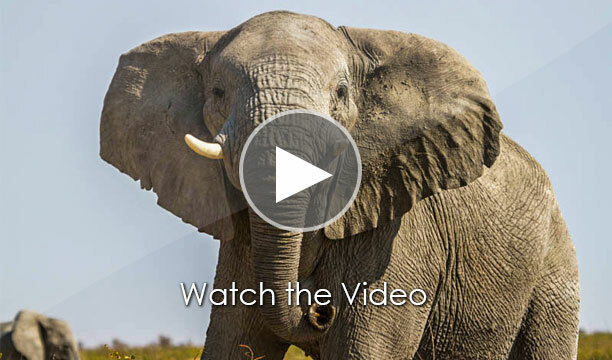 In around 2013, the poaching crisis spread, to other countries in Africa. First, Kenya was hit hard – its worst year for poaching was in 2013 when 59 animals were killed (more than 5% of the national population). In 2015 both Zimbabwe and Namibia were hit hard: Namibia lost 80 rhinos to poaching, up from 25 in 2014 and just two in 2012; while in Zimbabwe at least 50 rhinos were poached in 2015, more than double from the previous year. For Africa as a whole, the total number of rhinos poached during 2015 was the highest in two decades. 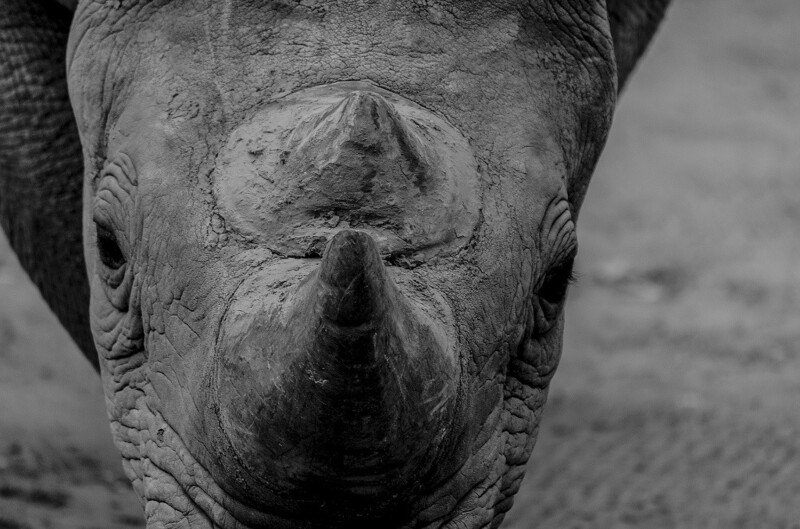 Large-scale poaching of the critically endangered black rhino resulted in a dramatic 96% decline from 70 000 individuals, in 1970, to just 2 410 in 1995. 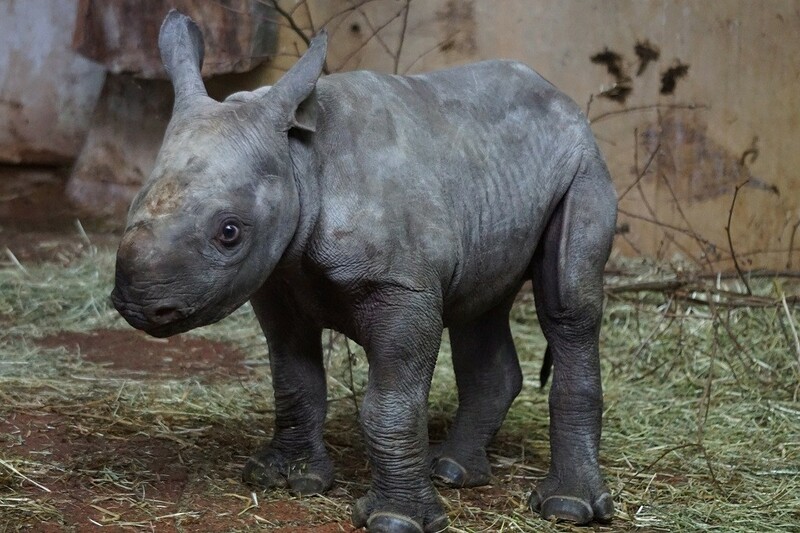 In the last decade-or-so, much of the world have united to tackle this devastating epidemic, but due to high prices on the black market coupled with, traditional Asian medicinal beliefs, and international crime syndicates, the black rhino remains critically endangered, and its desert-dwelling family even more so. By the 1980s, there were fewer than 50 desert rhino left; the last free-roaming desert-dwelling black rhinos of north-west Namibia. The desert-dwelling black rhino (diceros bicornis occidentalis) is a small subspecies, which has adapted to survival in the desert and semi-desert conditions of the Kaokoveld in north-west Namibia. Originally distributed in north-western Namibia and southwestern Angola, today this subspecies is restricted to wildlife reserves in Namibia with sporadic sightings in Angola. Hope for the preservation of their genealogy was dim… until the timeous intervention of two key elements; local community buy-in and international donor support. “Ever since formal rhino conservation in northwest Namibia began, in the early 1980s, innovative institutions, such as the conservancy model and Namibia’s Rhino Custodianship Programme, evolved to place local people, and their values, at the centre of the solutions to address the poaching,” said Jeff Muntifering, a conservation biologist with the Minnesota Zoo. This time around, SRT’s timely intervention enabled the trust to rapidly adjust and shift its focus. The emphasis moved from working in-the-field to concentrating more on the surrounding communities – a focus on partnering with them, and winning-over former poachers for inside intelligence. Along with their long-term commitment to the cause – SRT brought local and international knowledge, inter-agency relationships, manpower and funding to the party. They received cooperation from international conservation agencies, as well as the Ministry of Environment and Tourism (MET), the protected species division of NamPol and the Namibia Defence Force’s special field force. A key international organisation – Canadian gold mining company B2Gold – stepped forward in 2014 and sponsored the trust’s activities for N$1 million per year for three years for the period 2015 to 2017. 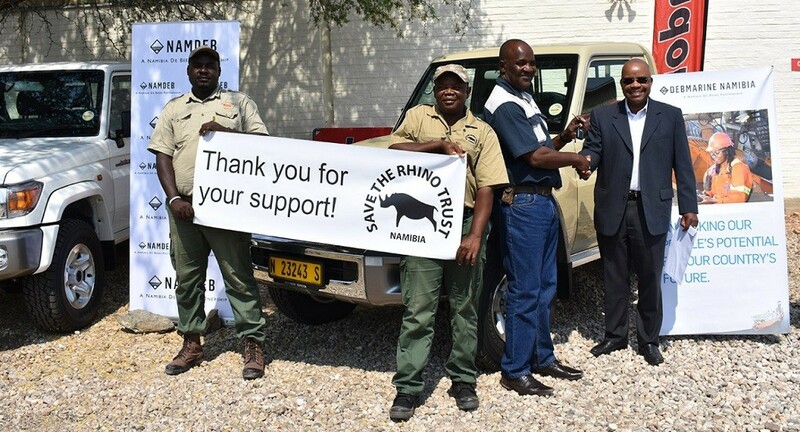 “We are part of something special, and that is saving a species from going extinct,” said B2Gold founder Clive Johnson, who further topped up their N$3 million donation with a N$600 000 cheque and pledged to continue their ongoing support of SRT. By late 2014, the area that spans about 35 000 square kilometres had anti-poaching coverage 365-days a year! “Through open and honest communication with our valued stakeholders, partners, donors and supporters, we have solidified our support base, both locally and internationally,” said Brandon Munro, a trustee of SRT. Although the increase in the desert-dwelling black rhino has kept the species from the brink of extinction – there are still not enough to restore the population to a self-sustainable level. For this reason, tallies and records of their distribution are guarded government secrets, known by only a handful of politicians and scientists working on their conservation. They are even sworn to secrecy with an official government confidentiality oath to protect this sensitive information to prevent syndicates from identifying potential targets. Thanks to the foresight of conservationists, the rhino population was stabilised and finally began a remarkable recovery. 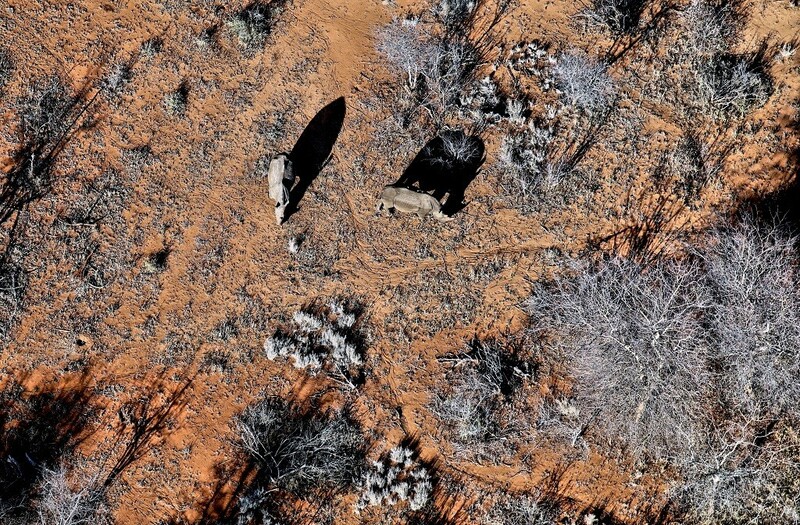 Since the first rhino was poached in 2012, the overall patrol effort has increased by 360%! The number of trained and equipped rhino rangers has grown from 0 to 55 across 13 conservancies – tripling the workforce. Poaching itself has been reduced by 80%, and last year alone – six separate poaching attempts were foiled after tip-offs from local informants! Donors were able to introduce partnerships and initiatives that would see the country become a leader in successful conservation, as well as a sought-after destination for conservation tourism. 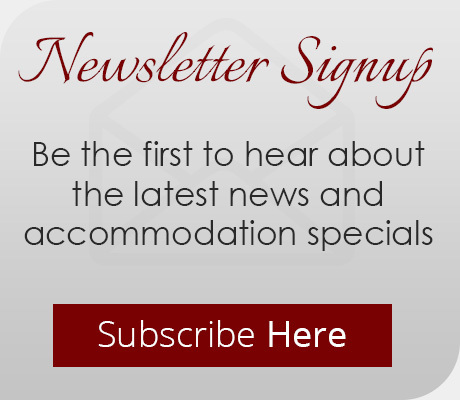 The survival of the desert-dwelling black rhino, in turn, started generating revenue through ecotourism, and now – conservation motivated tourism has become one of Namibia’s top GDP contributors. 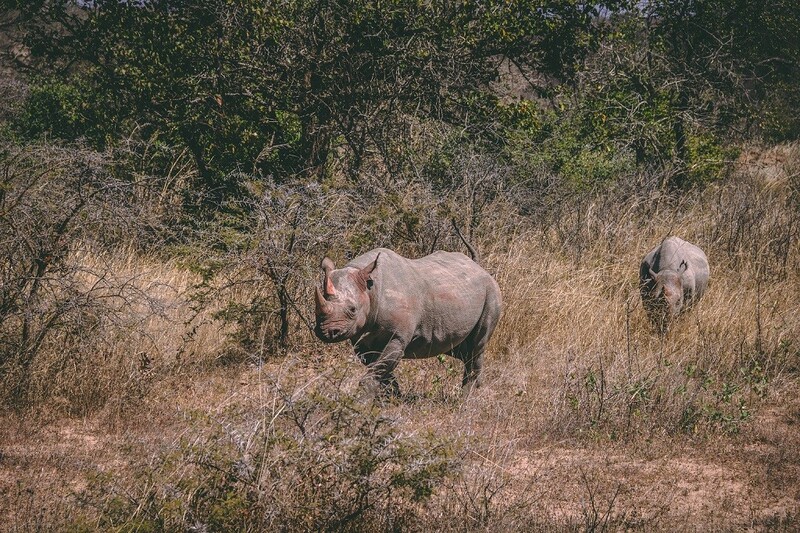 With jobs and revenue connected to rhinos, local communities have come to view these nearly two-tonne beasts as their own. This means locals are much more willing to report suspicious behaviour or overheard conversations to authorities to protect their own. 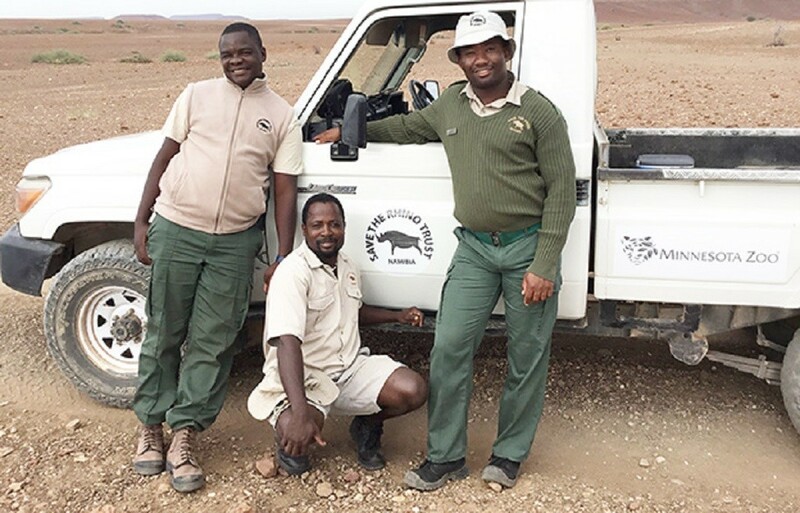 Muntifering says it’s the work with local communities that has made Namibia’s rhino conservation program one of the most successful in the world, even as poaching runs rampant elsewhere in Africa.